Milodon’s 45+ years experience of manufacturing oil pans truly shows! These oil pans fit and work better than any other we have tried. Designed for late model Mustang and Cobra kits. Suitable for extreme street or strip and gives good ground clearance whilst providing good oil capacity for high performance use. Oil control baffles subdue oil movement and provide increased horsepower, features Milodon’s distinctive gold irridated finish. Rear sump design features drain plugs on both front and rear sumps and late model Ford style, leak-proof screw-in dipstick fitting in pan. Pickups are braced to number 4 main cap for strength and will work with the 302 main support girdle. A 302 girdle will not allow use of a windage tray. 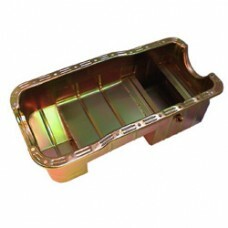 Designed for Small Block 302 Ford rear sump style. Pan capacity 7 US Qts. 8 1/4-inch sump depth at rear. Recommend pick up MIL18380.